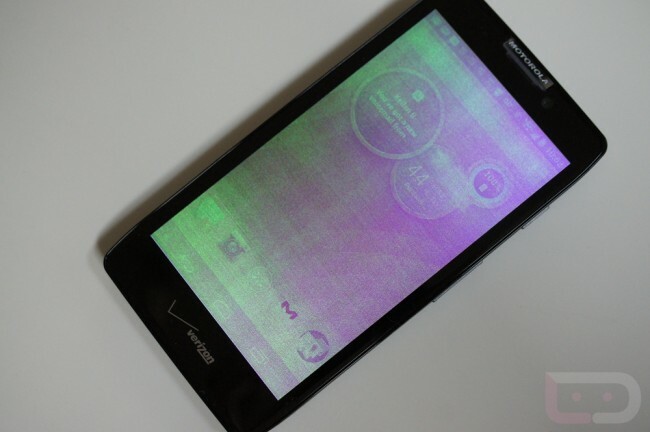 A few moments ago, I reached for my DROID RAZR MAXX HD, tapped the lock/wake button, and was greeted with a not-so-exciting purple and green mess on the display. I have no idea what caused it other than maybe, because the phone had been plugged into a wall for an extended amount of time. Thankfully, a simple sleeping then waking of the phone returned it back to normal. I originally posted the picture to Twitter, and a couple of you responded, having run into the issue as well. No one seems to know what’s causing it, but if it starts happening on a regular basis to you, you may want to try and capture it on camera, so that you can think about getting a replacement.